Keeping Up With the McCaslands: Weekend Planning! Linking up with My Happy House for weekend planning! Things always go more smoothly when we have a plan. Ryan is hard at work on the evening shift this weekend, which means EK and I have lots of time to ourselves. I try to find lots of outdoor morning activities or do a shopping trip on his night rotation weekend, so that we can keep the house somewhat quiet while he sleeps! Add me being on call to the mix, and even my best laid plans could go south at any time! 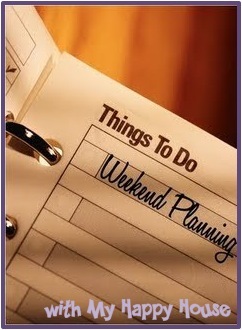 What kinds of things do you have planned for this weekend? CVS trip -- I wish we had one of those in my neighborhood. My dd works for Walgreens though so I love their coupons and using her discount since she lives with us is nice too :) Have a great weekend.